Cedric held his nerve to put Southampton through to the fourth round of the Carabao Cup on penalties after a 1-1 draw at Everton. Danny Ings' first-half goal put the away side ahead at the break, after Everton had dominated at Goodison Park while failing to test Saints stand-in goalkeeper Angus Gunn. There was more of the same after half-time, with Southampton close to scoring a second goal when Charlie Austin's header was turned over by Maarten Stekelenburg. Theo Walcott drew Everton level with five minutes to go when he finished from Oumar Niasse's through ball, but in the shootout the England international saw his penalty saved after Richarlison blasted over. 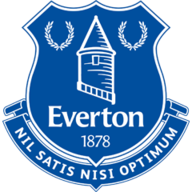 Everton: Stekelenburg (7), Kenny (6), Keane (7), Zouma (6), Baines (5), Davies (6), Schneiderlin (6), Lookman (6), Dowell (6), Bernard (7), Tosun (6). Subs: Niasse (6), Richarlison (6), Walcott (7). : Gunn (7), Yoshida (7), Bednarek (7), Stephens (6), Cedric (7), Hojbjerg (6), Lemina (6), Targett (6) , Redmond (7), Gabbiadini (5), Ings (7). Cedric confidently scored his deciding penalty to send Southampton through to face Leicester at the King Power Stadium in round four. 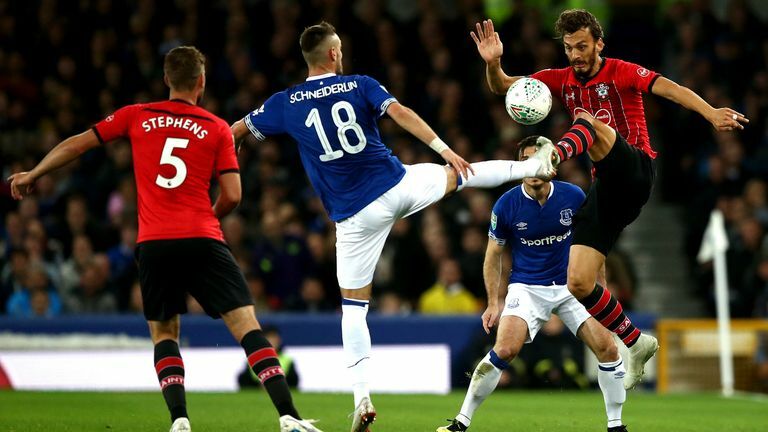 Everton controlled the first half of a game lacking the intensity of a league match by some distance, and they looked in no great hurry to break the deadlock. Gunn was a relative passenger considering the hosts' superiority on the ball, and though he was left scrambling from Ademola Lookman's curler, it flashed wide and was as close as Everton came. The hosts introduced Niasse at the break but things failed to improve, and Southampton came closest to the second goal of the night when Austin's header from a corner needed an acrobatic palm over from Stekelenburg. Everton kept Richarlison, Kurt Zouma, Michael Keane, and Cenk Tosun in from Saturday's win over Fulham. 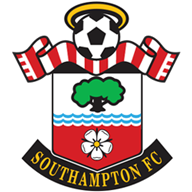 Southampton also made a number of changes, but kept Cedric, Mario Lemina, Pierre Hojbjerg, Danny Ings and Nathan Redmond in from the weekend. Silva increasingly threw caution to the wind, bringing on Richarlison and Walcott as the game drew on, but only in the final five minutes were their hopes realised. Niasse took full advantage when the otherwise resolute Southampton defence went to sleep, feeding Walcott on the right, and he placed the ball around Gunn to level. In the shoot-out, Richarlison fired over after a stuttered run-up but Matt Targett's miss put the scores back level, only for Everton to hand that gift straight back when Walcott's spot-kick was saved. That left Cedric the chance to seal Southampton's progression to round four, and he obliged by sending Stekelenburg the wrong way from 12 yards. In addition to his match-winning penalty, Cedric was in good form down the Southampton right, keeping Bernard and then Richarlison quiet and also arching a number of well-placed cross-field balls into the Everton box, that Southampton should have done better with. Everton travel to Leicester City for a Saturday 3pm back in the Premier League, while Southampton host Chelsea on Super Sunday live from 1pm. Pick your Sky Sports Fantasy Six-A-Side squad for that game to win £1,000.